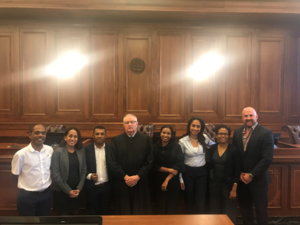 In mid-May, ACYPL welcomed its first delegation from Timor Leste for a 17-day exchange to Washington, DC, Boston, Massachusetts, Providence, Central Falls and Newport, Rhode Island and Cheyenne, Wyoming. The 6-member delegation represented the Reconstruction and Fretilin political parties. The program was conducted in partnership with the Government of Timor Leste. The program in DC focused on a variety of different policy issues that were of interest to the delegation. They had an opportunity to discuss recent environmental policy changes with officials from the Department of the Interior, and international development in Asia with the Commissioner of the US-China Economic and Security Review Commission. They engaged in a lively debate about US foreign policy with a senior foreign policy advisor for Senator Edward Markey (D-MA) office. The delegation also had the opportunity to meet with Congressman Jim McGovern (D-MA). In Massachusetts and Rhode Island, the delegation had a number of in-depth discussions on municipal and city politics. They were able to meet with members of the Boston, Providence and Central Falls City Council, and members of the state legislature to discuss the changing demographics of the communities, local schools and the economy. They were able to meet with Massachusetts State Senator Tony Cabral who was instrumental in assisting Timor Leste in regaining their independence from Indonesia. As a special treat, the delegation had the honor of being recognized on the floor of the Rhode Island Senate by Senator Daniel Da Ponte. In Wyoming, the delegation had an informative lunch discussion about city governance with Cheyenne Mayor Marian Orr and met with the Laramie County Commission to discuss the differences between city and county jurisdictions. They also learned about the judiciary system from the Chief Justice of the Wyoming Supreme Court, Michael Davis. The delegates returned to Washington, DC in time to attend the Department of State’s Professional Fellows Congress before heading home. In spite of a busy schedule of formal meetings, the delegation did have plenty of time for cultural activities. While in Washington, they had the opportunity to tour the DC monuments and attend a Washington Nationals game. The delegation was fortunate to visit the Vanderbilt’s Breakers Mansion and the beautiful cliff walks in Rhode Island and the Edward M. Kennedy Institute in Boston. In Cheyenne, the delegates had a great time at the Big Country Speedway watching the monster car races. The delegation had an enriching experience during their exchange with both meetings and cultural activities. ACYPL looks forward to developing its’ partnership and fostering a strong relationship with the Democratic Republic of Timor Leste.